What happened to Vol. 1.0 you ask , well that was Killing Mr Lebanon, which I already wrote about in past posts, and received a stellar rating of 4.5 out of 5. 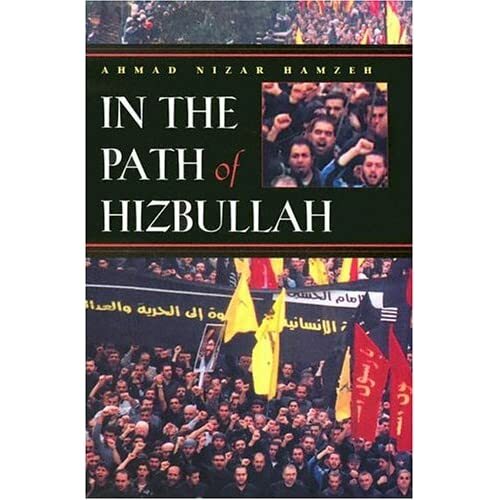 The second item on my reading list is In the Path of Hizbullah by Ahmad Nizar Hamzeh. For those who want an understanding of what Hizbollah is, how it works, and what it’s about, that isn’t tainted by Western preconceptions, this is a good place to start. Hamzeh goes through detailed numbers graphs and research to give you an idea of every working part of the Hizbollah apparatus (if you do get your hands on a copy of the book, check out the graph on page 46 that shows all 19 sections of Hezbollahs operation.) That being said, its not a completely ideal work on Hezbollah. The writing tries a little too hard to be academic with convoluted sentence structure and questionable word choice making the book not easily approachable for an average reader (but at only 150 pages it’s not so bad). Also occasionally the Hamzeh can be a little overly glowing about Hezbollah, which is understandable given the sensitive nature of his subject, but is also something to look out for. Hezbollah is a committed and principled organization, it has a complex structure of which the resistance arm is only part. Hamzeh steers clear of an in depth analysis of Hezbollah’s weapons, and instead focuses on their political and social network. Hezbollah’s social services are far more advanced and help far more people than does the government of Lebanon, not to mention most other small states. Hezbollah’s tie to Iran is difficult to understate, millions of dollars for its political and military aims are channeled through the supreme leader. That being said, Hezbollah is not tied to the government of Iran, but rather the supreme leader, Khamenei, who is essentialy at the head of Hezbollah’s religious government based on Velayat-e Faqih. Khameni and can provide final arbitration and guidance for Hezbollahs leaders. Hamzeh thinks Hezbollah uses politics and democracy to achieve its aims, not because it is a democratic institution. In fact the system of Velayat-e Faqih is not very democratic at all. Islamic order is it’s the final goal. Currently resistance is the key to achieving that. Hezbollah will continue to resist: until Jerusalem.